According to a report issued by the Asian Development Bank in 2008 , Thailand has 16 demonstration schools. Universities offering degrees in education established these schools to act as models of best practices for schools throughout the Kingdom of Thailand. Demonstration schools are intended to foster creativity and self confidence in its students. And this is what I discovered upon visiting the Prasarnmit Secondary Demonstration School:creativity and self –confidence being fostered in the students . I spent most of the afternoon of August 8, 2011 at the school, located in Bangkok at the end of Sukhumvit Road ,Soi 23. 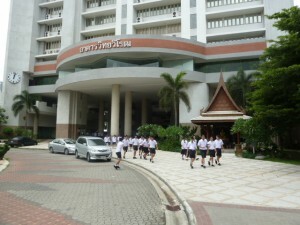 The school is in the campus of Srinakharinwirot University. The student body I was told numbers 2,000 students. It was established in 1952. Students must take a competitive school entrance exam . The result is a school full of gifted students. Can this school that also attracts gifted teachers be a model for other Thai schools? I was able to visit the school thanks to the kind offices of Ajaan Rossana . 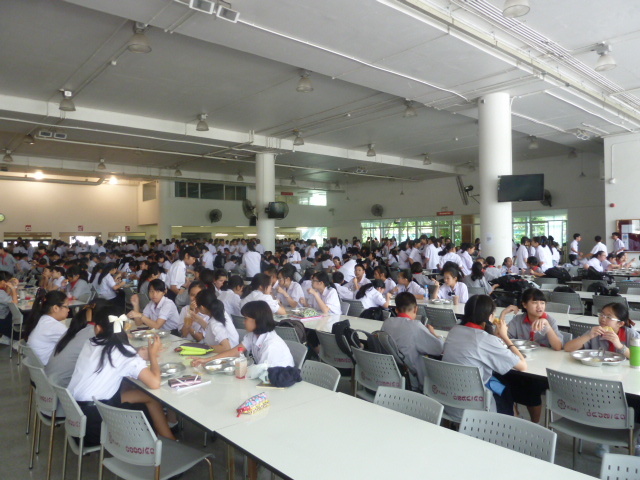 Active learning is alive and well in Thailand, at least at the Prasarnmit Secondary School . I wandered for about an hour and a half in the music section of the school peering into practice rooms and classrooms. 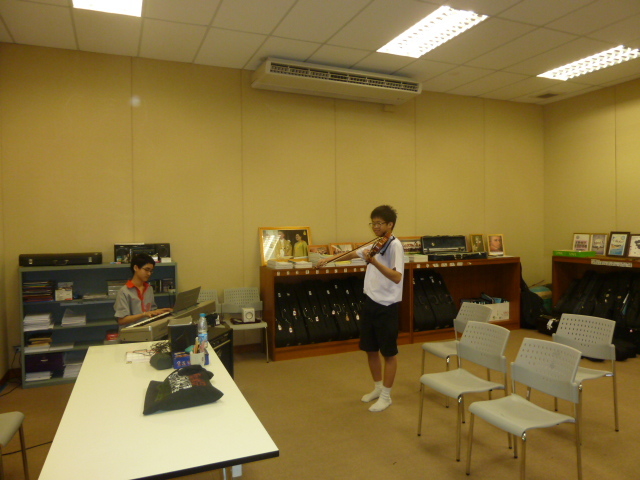 What I saw everywhere were students practicing together and sharing insights in how to become better. The students in the practice rooms were clearly self –directed. I talked with a half a dozen students and all had a good command of English and showed self confidence and maturity beyond their ages. I also observed classes where the music teacher acted as a coach , encouraging and helping students in their musical performances. The confidence being built in each youngster as they performed was clear. And an authentic assessment of the students’ work was easy . 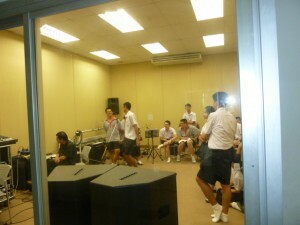 The students in the singing class had progressed to the point where the three students I saw performing were already stage ready. I was also able to observe an English language class. 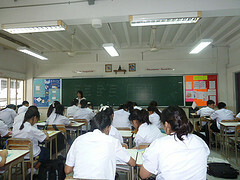 Again, there were many signs of a student centered learning environment. Ajaan Rossana and I observed the class for the 50 minute period. There were thirty –three students in this class of 15 year olds. Ajaan Kob was the instructor. The lesson she had prepared was the use of the present and past perfect tenses: not an easy lesson to teach. Nonetheless, Ajaan Kob engaged the interest of the students for the whole period. She displayed best practices throughout the lesson. 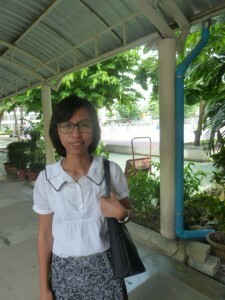 She used different techniques and approaches to teach the lesson every 10 to 15 minutes to avoid losing the attention of her teenage students and to appeal to the different learning styles of her students, particularly aural and visual learners. She spent the first ten minutes explaining how to use the present and past perfect tenses and making sure to give the students examples that they could see clearly on the blackboard. She then switched to large visual cue cards where she had prepared written examples of both tenses and asked students to identify the example she held up on her cards. Once she was confident that the class understood how the tenses were used , Ajaan Kob introduced the game Bingo modified to use the past perfect tense verbs she had presented. The game was fun and it was clear the whole class was intent in putting the correct verbs and verb tenses in the Bingo spaces in order to be the first to call out “Bingo”. Throughout the class , Ajaan Kob engaged the students by asking them to answer questions and to explain their understanding of the concept of the tenses. She never raised her voice and she smiled often. She posed questions and waited patiently for student responses. An interesting aspect of Ajaan Kob’s class was that after each 10 or 15 minute segment of her lesson delivery she would say to the students:” O.K. everyone sit up straight and get your back against the chair.” The class would assume a good seating posture. It was like preparing the students to refocus as she switched to a new segment in her carefully played out lesson plan. “ Do you think this culture of engaging the students in a friendly and encouraging way is spreading to other public schools in Thailand?” , I asked. “ Not as much as we would like”, was her rely. I suspect that Thai public school administrators in the rural areas of Thailand find little in common with the Prasarnmit School which has facilities and teachers that are rarely found in a regular schools. Rural teachers certainly could learn best practices by observing the teachers at Prasarnmit. But can this be done on a large scale?